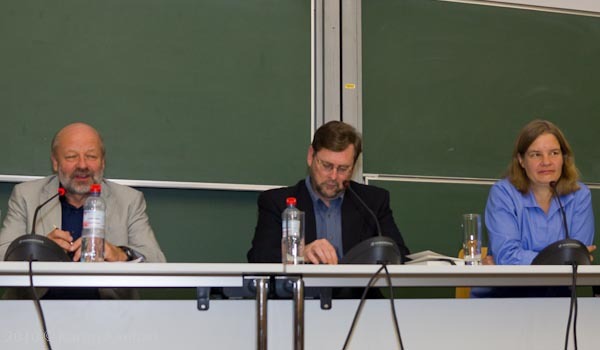 On October 7, 2010 American political writer Steven Hill discussed the challenges of sustainable energy policy – and politics – in the USA and Germany with Hans-Josef Fell, energy speaker for the German Greens. 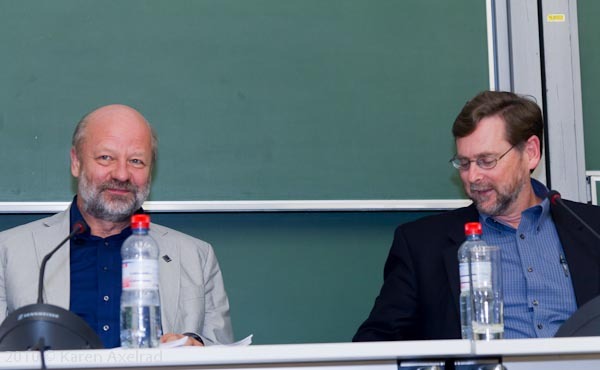 The discussion was held at the Free University Berlin and was moderated by Miranda Schreurs, director of the Centre for Environmental Policy Research at the FU. … and videos here and here. First each speaker presented his take on the state of alternative energy policy in his country. 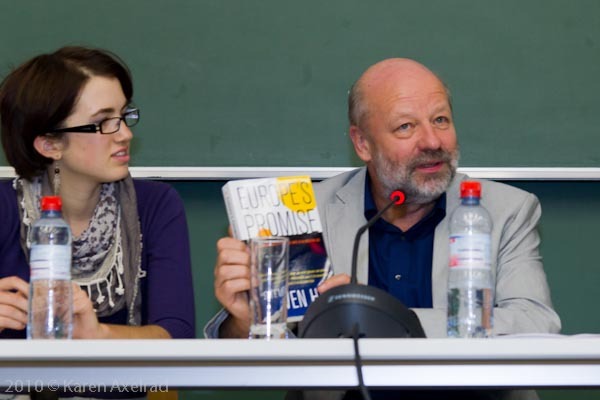 Hans-Josef Fell began by outlining Germany’s progress in alternative energy and the strategies that he and the German Greens hope to pursue. Above all he focused on debunking the popular notions that alternative energies are expensive and can’t be developed rapidly enough to cover our energy needs. He pointed out that Germany now has 340,000 jobs in the alternative energy sector, ten times more than it did ten years ago. The share of renewable energy used in Germany was projected to rise from 6 % in 2000 to 12 % by 2010. As a matter of fact, it has already risen to 17%. According to one report, Germany could move to 100% reliance on renewable energies by 2030. Thus, he argued, renewable energies are not a “burden to the economy”, they are only a burden for the old energy industries. In particular, they are a “declaration of war” against the nuclear industry – and the nuclear industry is fighting back, as we have seen over the past few months in Germany. In fact, nuclear energy is not necessarily cheaper than renewables if one takes into account the amount of money that has already been invested in it. Mr. Fell argued that a comparable investment now needs to be made in renewable energies. Despite the power of the nuclear lobby, he believes that it has already lost the fight, because the German people strongly support renewables. And, again, their cost is decreasing. According to a Duke University study, a turning point has been reached: photovoltaic energy has already become cheaper than nuclear energy. But the crucial question is whether we can move fast enough in the face of climate change and peak oil. Steven Hill began his presentation by mentioning a talk which Hans-Josef Fell gave in San Francisco, and how impressed he was to see a German politician visit an American city other than Washington. 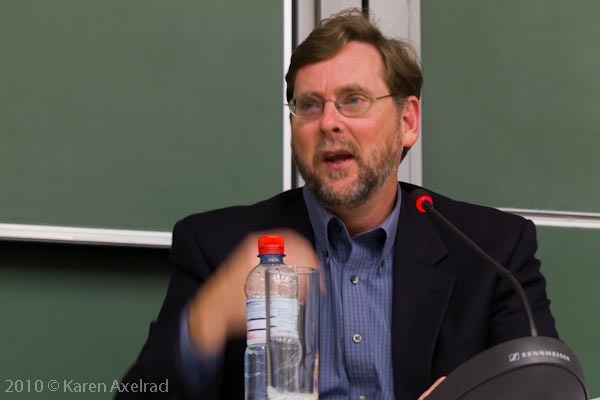 Americans need European politicians to give them more face time, he argued. The transatlantic relationship is more important than ever before, but both sides are turning away from each other and looking eastward, to China. The Copenhagen climate talks were Obama’s first chance as president to demonstrate a different kind of American leadership, and many Americans believe Obama “saved the day” there by brokering a deal with China. In fact, Mr. Hill pointed out, it was Europe that led the way by committing to a 20% reduction in emissions by 2020 and offering 30% if other countries would match it – only to be left standing “like a jilted bride at the altar” as the U.S. offered only a minimal reduction that gave China an excuse to do nothing. But Hill argued that Obama could not have accomplished more; his hands were tied by a sclerotic Senate (“even more dysfunctional than the House of Lords”) that is paralyzed by filibuster abuse. There is a wide public consensus to move forward on these issues, he said, but the political system is unresponsive. Within these restraints, though, Obama has made progress, personally intervening to ensure adequate funding for a high-speed rail system and supporting research on solar power, “good” ethanol, the energy grid, batteries and fuel cell cars. Progress has also been made on the local level, with Texas becoming a leader in wind power. However, many of these efforts have been stymied by the financial crisis. Mr. Hill is impressed by the prevalence of alternative energy and conservation in Europe, with a diversity of innovative regional solutions from power-producing “sea snakes” to strategies of “combined heat and power”. And he placed particular emphasis on common-sense solutions like fuel efficiency, the use of motion-sensor lights and reductions in standby power – “low-hanging fruit” that have not been picked in the U.S., where cars use 40% more fuel, the lights in office buildings shine all night and even toasters always have a light on. However, he noted, Americans are also capable of conservation, as they demonstrated during the Oil Crisis in the 1970s. Miranda Schreurs began the podium discussion by posing two questions to each speaker. She asked Mr. Fell 1) to talk about his paper on corporate finance and climate change, and 2) asked how Europe can move forward given its diverse energy structure (Poland, for instance, is still heavily dependent on coal). And she asked Mr. Hill 1) how much potential for bottom-up change he sees in the United States, and 2) what happened to cap and trade, an “American baby” that came out of acid rain policy and has now been adopted by the Europeans who initially rejected it, but rejected by the Americans. And before giving the floor to the speakers she pointed out that the Free University’s campus has been “greened” and now uses 20% less energy than it did 10 years ago. Mr. Fell began by stating firmly that, due to pressure from the fossil fuel industry, there will be no global progress on climate change. Instead, we need several nations to enforce regulations that encourage private money to go into renewables, causing an energy revolution to spread. This strategy is outlined in a paper of his. This must be private money, not public money, he emphasized, because the states are all in debt. Obama’s problem is that he wants to stimulate the economy with public money, which only means increasing state debt. Feed-in tariffs should be introduced on the one hand, and on the other hand companies such as BP must be made to pay for damages they cause. If these kinds of external costs are factored in, he argued, conventional energies are too expensive; they are “cheaper” because they are subsidized. As for Europe’s energy diversity, he said that it is important to get countries such as Poland to begin investing in renewables in the first place, but in the long run, though Poland’s coal industry may protest, coal will become more expensive and renewables will become cheaper in any case. Mr. Hill began by addressing the cap and trade issue. Under Bush, he pointed out, leadership came mainly from the states. California has been a leader in drafting cap and trade legislation, but can’t implement it without cooperation from other states. And now its legislation has been suspended until unemployment reaches 4% or less – an impossible goal. Meanwhile, the House has passed a cap and trade bill, but the Senate has been stalling on it. Bottom-up change is hard to take to a national level when the government is so dysfunctional. Here Mr. Fell pointed out that the stalling of cap and trade legislation could present an opportunity in the U.S., providing a chance for a new feed-in tariff law which would be much better than a cap and trade solution. Mr. Hill offered a glimmer of hope: if the Democrats keep control of Congress, they are likely to introduce a climate bill early on, as the other major points on their agenda (health care, financial reform, etc.) have already been dealt with. The discussion was then opened to the audience and continued for at least another half an hour, with far more interesting questions than could be dealt with!